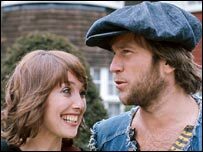 Actress Una Stubbs is to join BBC One soap EastEnders as an eccentric and protective aunt - appearing alongside her real-life ex-husband. From August, the 69-year-old will play Aunty Caroline, who arrives to help her niece Honey Edwards prepare to marry Billy Mitchell. 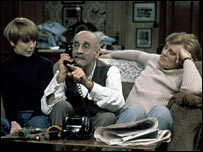 Honey's father in the long-running show is played by actor Nicky Henson, who was married to Stubbs for six years. The couple have two sons and divorced in 1975, but have stayed friends. Stubbs will also be reunited with Barbara Windsor, who plays Peggy Mitchell. The pair have known each other since they were teenagers and appeared together in a stage version of Cabaret. "It has been a life-long ambition to be united on screen with Nicky Henson and Barbara Windsor, who are two very good friends of mine," Stubbs said. "I'm delighted to be joining the cast of EastEnders, having been a fan for many years." Stubbs is best-known for playing Aunt Sally in children's TV series Worzel Gummidge and Rita in 1960s and '70s sitcom Till Death Us Do Part. 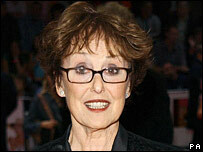 She also appeared as a panellist in 1980s ITV game show Give Us a Clue, in which celebrities played charades. Stubbs's character will be "outgoing, eccentric and vivacious"
She has also been a character in Midsomer Murders, Heartbeat and, recently, The Catherine Tate Show. In EastEnders, Stubbs's character would be "outgoing, eccentric and vivacious," a programme spokeswoman promised. "Not only will there be tension between her and Billy, but also between her and Peggy. "She is protective of Billy, so the two women will go head-to-head."